Ben Jones-Bishop scored a hat-trick against Catalans Dragons on Saturday. Ben Jones-Bishop scored a hat-trick of tries and Tom Johnstone bagged two as Wakefield ran out 38-18 victors at Catalans. Wakefield started much the brighter and deserved the opening score, Sam Williams kicking a penalty after David Fifita had been fouled by Remi Casty. Tom Johnstone scored two tries in France -and could have had at least two more. In the 13th minute, another penalty gave the Wildcats a chance to attack down the right. The ball was sent to the right through Scott Grix to Jones-Bishop, who managed to step inside the Catalans cover to score in the right corner. Williams missed the conversion. Catalans kicked the restart out on the full, the resulting penalty again allowing Wakefield to attack close to the hosts’ line. Williams and Joe Arundel combined to get the ball to Jones-Bishop, who acrobatically managed to touch the ball down to extend the Wakefield lead to 10-0 before Williams missed the conversion. Wakefield could have extended that lead further in the 21st and 26th minutes, but on both occasions good work by Craig Huby was undone by handling errors from Johnstone. The Wildcats did extend their lead short of the half-hour mark, with Catalans putting a nice attacking move together down the right. Thomas Bosc looked to find Iain Thornley, but the pass was intercepted by Johnstone who juggled before racing 90 metres to score close to the posts, making Williams’ kick a formality. Catalans did register their first try of the game before the interval, Alrix Da Costa feeding Benjamin Garcia, who escaped the tackle of Bill Tupou to race over close to the posts. Luke Walsh added the conversion to sustain his excellent goal-kicking record in 2017. After the break, Wakefield opened with a free-flowing try that saw Huby, Dean Hadley and Kyle Wood combine to send Arundel over in the right corner. Williams again missed the conversion as the score remained 20-6. Catalans responded directly from the kick-off, with Jason Baitieri collecting the ball after it was allowed to bounce by Wakefield. The ball was sent to the right to Krisnan Inu, who powered his way over the line despite four players attempting to tackle him. Walsh added the conversion to reduce the Wakefield lead. In the 52nd minute, Wakefield forced a goal-line drop-out, Grix’s kick forced dead by Bosc. From the drop-out, the ball was sent to the left, where Jacob Miller fed Matty Ashurst to run a great line back on the inside and score under the posts. Williams’ goal made it 26-12. Short of the hour mark referee Gareth Hewer ruled that Catalans had dropped the ball, with replays showing that Richie Myler had had the ball stolen from him by Fifita. From the scrum, Tupou broke down-field. Thornley chased back to haul him down, but he held Tupou down too long and was penalised and sin-binned. Five minutes later, Jones-Bishop raced away to score his hat-trick try from a Catalans kick downfield which he caught on the full. Williams goaled to extend the Wakefield lead to 32-12. With 11 minutes left, Paul Aiton scooted from the play-the-ball to feed Myler, who chipped to the left corner where Fouad Yaha juggled and touched down, with Walsh adding the extras. From the restart, Catalans looked to attack down the right. Myler’s pass was behind Inu and the ball went to ground before being picked up by Johnstone, who raced 80 metres to score under the posts. 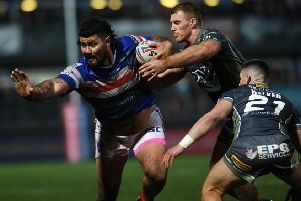 Williams’ goal rubber-stamped Wakefield’s second consecutive win at the Stade Gilbert Brutus.